We have a lot of lambs quarters growing in our garden. I weeded much of it out to make way for my regular garden vegetables, but I keep a small patch here and there to harvest for salads, cooked greens, and freezing for the winter. I am able to harvest much more lambs quarters than spinach (which tends to bolt quickly in our Midwest heat) and I like the flavor even better. Last week Joe and I harvested several large buckets of lambs quarters and I washed, blanched, and froze them for later. You can do the same and have free greens in your freezer ready to heat and eat when there aren’t any veggies to pick. 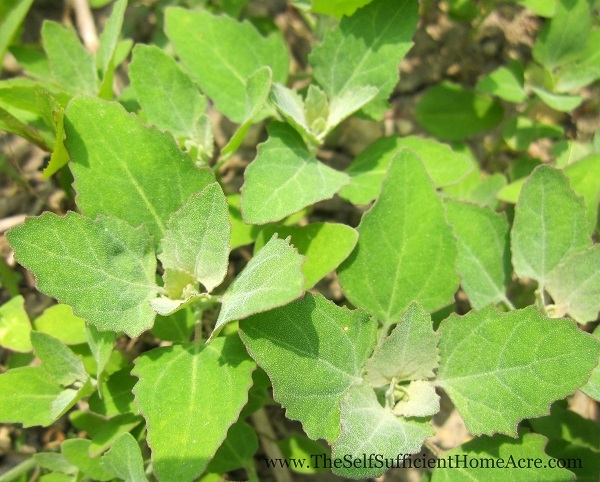 Pick lambs quarters when they are young and tender for the best results. As they get older you may still harvest the newer leaves from the tops of the plants, but they tend to get tough as the flowers are forming. Morning is the best time to harvest when the temps are cooler. Soak the greens in cool water for a few minutes and rinse away the dirt. Blanch the greens in boiling water just until the color changes to a deep green and the leaves are limp. You don’t want to cook for too long and lose the nutrients. Blanching kills the enzymes that cause the nutrients and flavor of vegetables to deteriorate in the freezer. Remove the blanched greens from the pot, drain, and cool in a shallow pan in your refrigerator. When they are completely cooled, pack them into freezer containers or bags, removing as much air as you can to prevent freezer burn. You may use a vacuum sealer but be sure to drain the greens thoroughly to prevent excess moisture from being sucked into the motor of your machine. Pack enough in each bag for one or two meals. Don’t be tempted to save time and bags by packing a huge gallon size bag if you won’t be able to use it all at one time. It is nearly impossible to break up a huge chunk of frozen greens. You may also freeze the greens in a shallow pan before packing them into a bag. This way you can pack the frozen greens loosely in bags that can be opened and only partially used. Label your bags of blanched greens with the contents and date, then place in the freezer. Use your frozen lambs quarters within a year for the best flavor and nutritional value. Do you preserve foraged foods for the winter? What are your favorite ‘weeds’ to harvest and preserve? That sounds delicious 🙂 I haven’t used them in smoothies, will have to try one! I am still allowing the lambs quarters to grow in my garden. It’s nice to have a plant that will fill in where something else isn’t doing well. We have this growing all over our property and I had no idea it was edible. Score! You’ll enjoy this free wild edible, Kylie! Best wishes! I was delighted to find a volunteer lambsquarters plant in my squash bed this year, been nibbling at it all spring. I don’t think I’ll get enough to freeze this year, but I’m hoping to save seeds… for some reason they don’t seem that common near me… in the wild I find one here, one there, but never a “patch of them”, so I’ll try to cultivate them from saved seeds, because I love the stuff! If you leave a plant in place, it will plant plenty of seeds for you! I hope you have time to add some to your freezer, Katie and Mark! This looks like young quinoa to me. Is it related? I have a small garden and don’t think anything like that is growing wild. Looks great though, and would expect nothing less from the Self-Sufficient HomeAcre!! I’ve read that certain varieties of lambsquarter, or Chenopodium Album, are responsible for producing seeds we know and use as Quinoa. Great idea to freeze them but would like recipes to go with the info you shared. I am fortunate to have been born 100 feet from the barn right here on the farm where I still live and raise two sons with my husband of 36 years! We have always used lambsquarters as a staple, my whole life of 57 years! Simple serving is best…Steam, drain, add a touch of butter, ground pepper and a sprinkle of apple cider vinegar…lemon will do if you do not have the vinegar! We also prefer lambsquarters to spinach, or Swiss chard as not only are they free and grow wherever you would like them, they do not bolt as the other greens. This evening I am freezing for our winter treats. I do the hot water blanch just for a minute or two and plunge into cold water, drain on a rack in the fridge to cool, then transfer that pan to the freezer, so the stalks are individually frozen for packing…much nicer presentation then a BLOCK of frozen mush! I really feel sorry for those who have not discovered them, and find it odd no seed catalogue markets the seeds! For those of you fortunate to have an edible”weed” enjoy, and think of the hundreds of early settlers and farm folks like my self that the lambsquarters are just part of any harvest! My motto is eat the seasons! We start with the maple syrup and the wild edibles in the hard wood bush, and carry on all year in that manner, and by the dead of winter are making our way through the root crops in storage and anything canned or frozen! Happy Harvesting! From the hub of the Great Lakes! That’s great! And you are welcome to comment any time 🙂 Your serving suggestion and freezing methods sound wonderful, thanks so much for sharing! Would the hub of the great lakes possibly be Michigan?! You cut the stalk and blanche it without removing the leaves?? Just curious we have a LOT in the garden and have kept it this year an it is tall. Bitter is better so the taste does not bother me but curious on the blanching of the stalk. I picked mine when it was young and tender. As it gets older, I would advise just using the leaves because the stalks get very woody. Blanch like you would spinach. HI Christine, The fun of naturally growing plants is the fact so little work goes into the “crop”. On our farm, we never pull them from the rows as weeds…as they grow tall, just harvest the individual stalks coming off the main stalk. You certainly do not want to be removing every little leaf!! That is just too tedious, and when blanched would wither to nothing. You also want something for those leaves to hold onto when you lay them on a rack to drain and freeze before bagging! If you have to use the main stalk for that, so be it…comes the middle of winter and you are preparing them, just discard the tough stalk then! Best wishes with your weed eating and freezing, Terri! I don’t know if you can. They grow wild here in the US, but I don’t know if they grow in Australia. Check to see if they are a common weed in your area and if so, you can harvest them for free!